4. 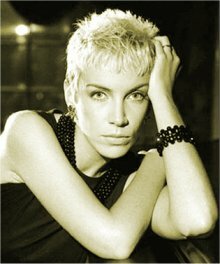 Cut my hair as short as Annie Lennox( look at the pic for reference). Unfortunately I couldn't even consider this without fearing for my life. I can just imagine the look on my mom's face, turning a shade of putrid green(in terrific anger) before she executes her diabolic plans of murder( The victim: me, of course) . So these are the resolutions I "try" to make year after year in vain. Maybe next year, I will get over my fear of frogs or Ranidaphobia as only a science nerd( which is what I am) would know. Or maybe I'll face death, brandishing my sword of recklessness and cut my hair..............only time will tell.